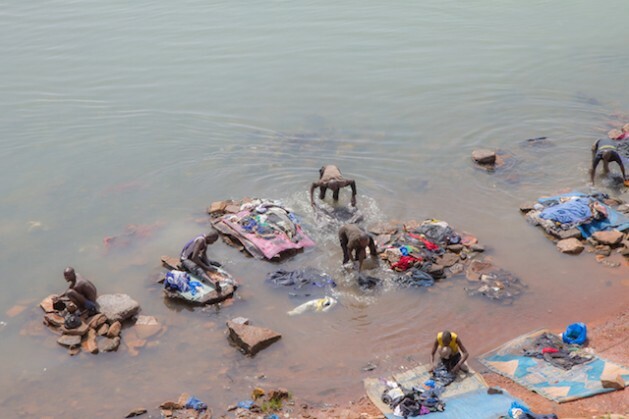 BAMAKO, Feb 6 2014 (IPS) - Under the harsh Sunday afternoon sun, Daouda Dicko washes his client’s clothes on the shore of the Niger River, which runs through Mali’s capital, Bamako. “I started doing this to survive two years ago. Now, I am used to it and I don’t mind the extra money it brings,” Dicko, who also works as a gardener, tells IPS. Dicko struggled to feed his family during Mali’s political crisis in March 2012 when Tuareg rebels and then Islamists took control of the country’s north, which comprises almost two-thirds of this West African nation. But military intervention from France liberated the north in January 2013 and led to elections here in July that year. The conflict destroyed Mali’s economy and created pressure on households. But the country’s economy is slowly showing signs of improvement. Binetou Diarra arranges plump tomatoes on her wooden stall in the Quartier du Fleuve, a market in Bamako. “Prices increased a lot a year ago. But now they are back to almost normal,” 37-year-old Diarra, who is wearing a T-shirt from last year’s presidential campaign, tells IPS. Cooking oil, which had risen to a high of 1,200 CFA (2.47 dollars) in September 2012, has now come down to 850 CFA (1.75 dollars). But in Bamako, it is not only in consumers’ pockets where one can find visible signs of economic recovery. Hotels, which were all closed between 2012 to 2013, have now reopened. However, they are no longer filled with the 250,000 tourists whom, according to the Mali Tourism Office, would flock to the country back in 2009. The Hotel de l’Amitié, one of the tallest buildings in the capital, has now become the seat of the United Nations mission here. Other hotels are filled with staff from NGOs and from other missions to help get Mali back on track. Restaurants and business are also busy with the return of expatriates. Fatoumata Coulibaly and her friends have stalls close to several expatriate neighbourhoods. And the return of the expats has had a direct effect in their wallets. “There is more money coming in. It is not easy to survive, but we are positive. We know the worst is behind. Inshallah,” Coulibaly tells IPS. In January, Christine Lagarde, managing director of the International Monetary Fund, said that Mali’s GDP growth will increase by 6.6 percent in 2014, which is a higher growth than the 5.7 percent predicted a couple of months earlier. But it will be a challenge. When sanctions were imposed here after the 2012 coup, the country lost the 30 percent of its 3.5-billion-dollar budget that was foreign-aid dependent. The government’s centralised offices in the Cité Administrative, a Sahelian-inspired complex on the Niger River’s shore, became a phantom district for over a year because of the money shortage. “We have been totally paralysed during the crisis. I received my salary, but it was late. And we had no budget to pursue operations. But now things are back to normal. We are paid and we have the tools to work,” Fofana Daouda, a civil servant from the ministry of family, tells IPS. But while the country’s capital is experiencing a slow recovery, Mali’s north still lacks economic opportunities and many are still living in extreme poverty, says Dedeou Traore, a member of parliament for the northern region of Niafunke. “The economy is bad,” Traore tells IPS. Northerners, whose livelihoods were largely dependent on subsistence agriculture, have lost everything. “In Niafunké, the Prefect is back, but the Justice and other state institutions [have not returned]. People feel that they are abandoned,” Traore says. In May 2013, international donors offered almost 3.5 billion dollars to reconstruct Mali. But this week donors are meeting in Brussels as only half of the funds have been received. Meanwhile, Oxfam International has called for better governance and the better distribution of state resources, in a report released on Feb. 5. “The situation in northern Mali remains fragile. Donors must not forget that more than 800,000 people need immediate food assistance due to the impact of conflict, weak harvests, and poor rains. Mali needs a comprehensive response to the many challenges it faces,” says Mohamed L. Coulibaly, country director for Oxfam International in Mali. Aicha Belco Maiga is a member of President Ibrahim Boubacar Keita’s Rally for Mali party, which has the majority seats in parliament. She represents the region of Tessalit, one of the most remote and arid places in Mali near the Algerian border. “In Tessalit, all economic activities have stopped. The town is empty. People who stayed had to sell their belongings for food. There is nothing to eat. There is no functioning administration. It is so bad that you see more Algerian dinars being exchanged than CFA Francs [Mali’s currency],” she tells IPS.